What Day Of The Week Is October 10? 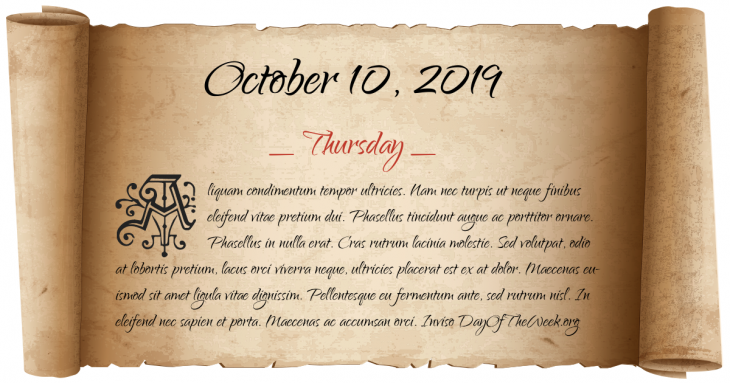 October 10, 2019 is the 283rd day of the year 2019 in the Gregorian calendar. There are 82 days remaining until the end of the year. The day of the week is Thursday. Battle of Dormans: Roman Catholic forces under Duke Henry of Guise defeat the Protestants, capturing Philippe de Mornay among others. A Saxon army takes over Prague. The Chinese Communist Party and the Kuomintang signed a principle agreement in Chongqing about the future of post-war China. Later, the pact is commonly referred to as the Double-Ten Agreement. In Montreal, Quebec, a national crisis hits Canada when Quebec Vice-Premier and Minister of Labour Pierre Laporte becomes the second statesman kidnapped by members of the FLQ terrorist group. United States Navy F-14 fighter jets intercept an Egyptian plane carrying the Achille Lauro cruise ship hijackers and force it to land at a NATO base in Sigonella, Sicily where they are arrested. The Greek city of Volos floods in one of the prefecture’s worst recorded floods. The 10 October 2008 Orakzai bombing kills 110 and injures 200 more. Armenia and Turkey sign protocols in Zurich, Switzerland to open their borders. Who were born on October 10?